WordPress is a popular Content Management System out there. Its simplicity, extensibility and flexibility make WordPress one of the most deployed and user-friendly publishing platforms in the industry. Tons of powerful WordPress Plugins also contribute a major part in its soaring popularity. The reason is simple – plugins are the best way to extend the ability of WordPress powered websites or blogs to meet individualistic needs. Truly speaking, plugin is one of the great things about WordPress. It helps in enhancing the pre-built functionality of a website or blog. Generally, plugins are PHP scripts that have the ability to make changes in the site. Be it anything right from the simplest tweak to log-ins work, triggering emails or more. By installing WordPress plugins properly, you can boost security, SEO and other functionality of a site according to your needs. Literally, thousands of WordPress plugins are available out there through which one can optimize the performance of a WordPress website or blog. In this post, I have rounded up some of the most useful WordPress plugins that you’ll love. Hope, you will find my collection of plugins quite worthy. WP to Twitter updater is an awesome plug-in that automatically posts a Tweet from your WordPress powered blog to Twitter profile. It uses a free URL shortening service for auto-posts. Interestingly, this plug-in comes with full support for all your custom post types. By using Wp to Twitter updater. You can easily notify the Twitter readers about your new blog posts automatically and get a link back to your post from Twitter as well. Integrate TwitterCounter plug-in to your blog and flaunt the number of followers you have on Twitter. It displays TwitterCounter button and Twitter Widget as well. By using WordPress Admin, you can even customize it. It is a powerful plugin that easily integrates Twitter account with your WordPress blog and enables you to post new tweets automatically. Tweetable will never let you feel ignored in the wide world of Twitter. By using this plugin, you can display all your latest tweet posts on your dedicated Twitter page hassle-free. Enjoy the benefits of retweeting with TweetMeme plugin that allows your blog post to be retweeted throughout Twitter. It will also display live tweets count from Twitter. Interestingly, TweetMeme is an easy to install and customize plugin with quicker loading times. Manage your blog post with easy-to-use Editorial Calendar – perfect plugin that allows you to schedule your posts. To avail benefits of this plugin simply add a calendar page to the post section available in your admin area. In this way, you can schedule posts for each day. 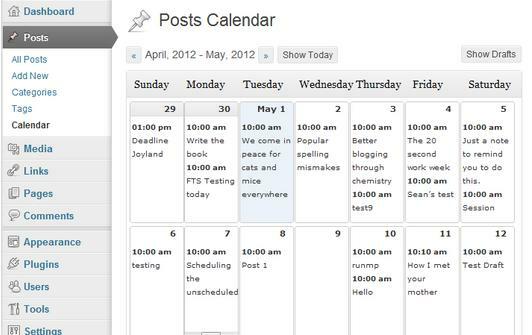 Besides that, Editorial Calendar also allows you to schedule multiple posts in sequential order. Interestingly, this plugin enables you to edit titles and publishing times as well. Simply change the post status from “Draft” to “Pending review” to “Published” or “Scheduled” in the calendar, and manage your entire blog. Another powerful plugin introduced by WordPress is Adminimize. It enables you to hide all ‘unnecessary’ items from the backend. By using this great plugin, you can make modification in the back-end options, dashboard options, global options and link options . It will also let you change the write options, mostly used for posts, pages and custom page types. With Adminimize, you can activate or deactivate menu and submenu. 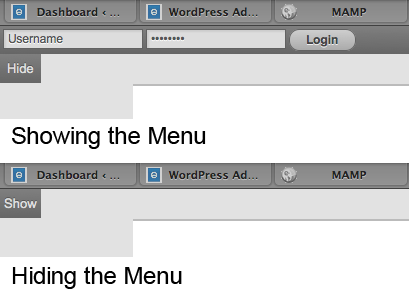 An interesting plugin has been introduced with the advent of the WP 3.1 version : WordPress Admin Bar (Improved) provides a complete control over the admin bar of your WP. This plugin is easily compatible with WP 3.3 version. By using WordPress Admin Bar (Improved), you can disable and activate various default things in your Admin bar such as the website’s name, links, custom menu items, log-in bar, registration link and more. Unfortunately, this plugin is not compatible with earlier WordPress versions. Redirection is a great WordPress plugin extensively used in WP powered websites and blogs to manage 301 redirections. By using this plug-in, you can also take advantage of 404 errors without sound knowledge of Apache .htaccess files. With Redirection, you can easily fix all loose ends such as broken links of your site hassle-free and make the web portal Google-friendly that offers top-notch user experience. You can automatically create 301 redirects with this plugin. In this way, the Redirection plugin enables you to redirect your web pages to a valid URL. Besides that, it will help you to keep a record of various requests for bad links and create custom redirects. By using Redirection, you can conduct 404 error monitoring on a regular basis and have a complete log of 404 errors and map 301 redirects. Extend the power of your WordPress website or blog with powerful and useful WordPress plugins depending upon your custom needs. To get started, all you need to know is exactly what and which level of flexibility you’d like to have. This really is such a great resource that you are offering and you provide out at no cost. I appreciate seeing sites that realize the worth of offering a perfect helpful resource entirely no cost. I genuinely loved reading your submit.